Traded in the trainers for the boots today. Even though the forecast was for rain and more rain, I was still adamant I wanted to hit the hills. Sonic and I were joined by Athole, David (Athole's pal) and Ben. We met them at Bridge of Orchy, as we were planning on doing Beinn Achaladair (1038 metres) and Beinn a Chreachain (1081 metres). 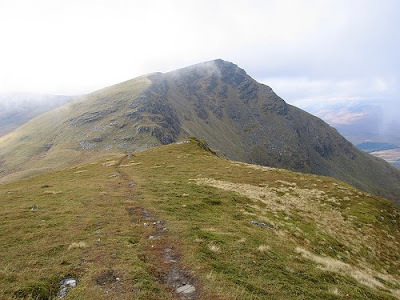 Two new Munros for me. Thankfully the weather forecast was slightly out. It was quite dull and windy, but we never had a drop of rain. The cool conditions were a welcome relief, as on previous trips I found I overheat quite quickly. And subsequently wilt. Considering I was out with four boys, the pace was quite steady. I'm sure they would have been up there like a rat up a pipe, if it wasn't for me though. Mind you, we finished the circuit well before the 6.5/8.5 hour time allowance recommendation, so I couldn't have been that slow. So that's me on 96 Munros now. I really want to get to 100 before I get too fat. Then I've only got the small matter of the other 184. Sonic's done 242 (he started when he was 16!) so I've got a bit of catching up to do. That ridge looks inviting. Sorry we missed that walk. We'll try to join you next time!